Google AdWords is now Google Ads. The rebrand took place on July 24, 2018. The change did not impact existing campaigns and the concept of AdWords has remained unchanged. Roofing Webmasters continues to manage Google Ads for roofers to produce ROI and sustainable lead generation. With a Google certified campaign manager on staff, Roofing Webmasters is considered the top PPC authority for roofing contractors. Failed ad campaigns often overlook one or more of these components. 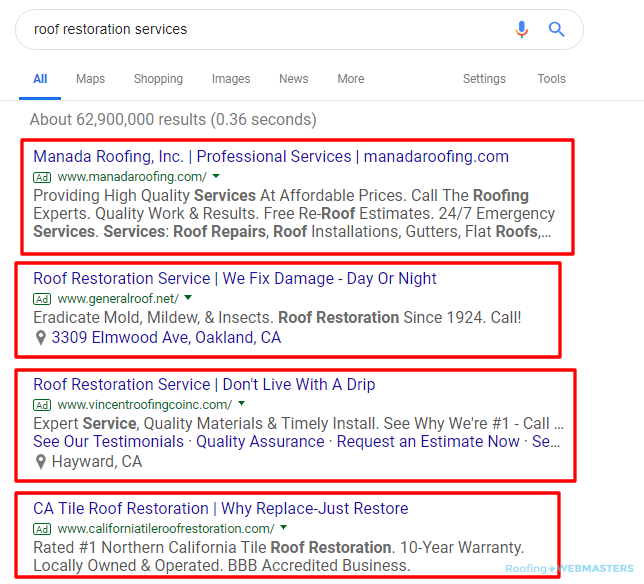 Some roofing companies get carried away with keyword research, and attempt to rank for terms and phrases that don’t lead to high conversion rates. At Roofing Webmasters, we only target words with buyer intent. An example of a bad keyword target for roofers would be “how to repair a roof”. This phrase indicates someone interested in DIY tips rather than someone ready to invest in roofing services. Their click would cost money but not lead to any coming back. While there is such thing as over-analyzing data, these metrics paint a straightforward and useful picture of your campaign’s performance. Too often, roofers fail to properly track performance, which leads to a negative return on investment. Launching a campaign is only step one of the PPC process, a fact that companies too often ignore. To really maximize revenue on a pay per click campaign, regular measurement and analysis is required. As a roofing contractor, you probably don’t have the time or resources to incorporate this kind of tracking. Roofing Webmasters is here to solve that problem for you. We will handle every aspect of your Google Ads campaign. Some roofing contractors are hardheaded, and want to handle every aspect of the business themselves. The truth of the matter is, there just isn’t enough time in a day to run a roofing company and manage a PPC campaign. Contractors who attempt to do both end up wasting valuable marketing dollars on half-hearted campaigns. Roofing Webmasters has years of experience working with contractors just like you and has the unique knowledge to execute the perfect PPC campaign. Some of the contractors we speak with, call us disheartened after being swindled by a cut-rate PPC company who use black box billing and the shell trick. The company ended up hijacking their Google account, draining its budget, and producing zero leads. Pay per click can be a nightmare without the proper assistance. That’s why it’s best to invest in a paid advertising management company that specializes in your industry. Roofing Webmasters is uniquely qualified to handle every detail of your campaign and looks forward to helping you grow your business exponentially in 2019. Updated on March 14, 2019 at 7:53 pm by Roofing Webmasters.